Motorola isn't on IFA this year but that didn't stop the future Lenovo subsidiary from announcing its long-awaited Moto X and Moto G second generation smartphones and the rounded Moto 360 smartwatch running Android Wear. We were live at the event and are here to share our impressions with the three new devices by Motorola. 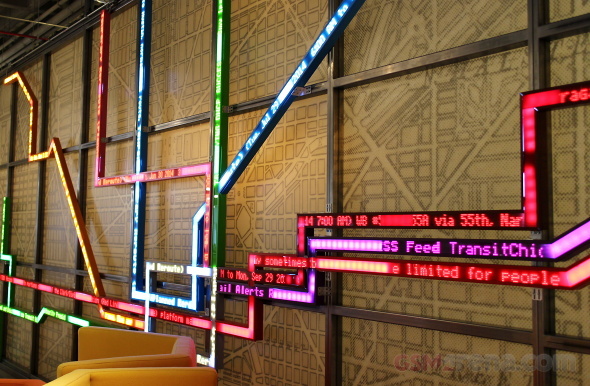 Before we got to see the new Moto X and Moto G and play around with the Moto 360 we were taken on a tour of Motorola's building and headquarters in Chicago, housed in the upper floors of the Merchandise Mart building that's been there since 1931. After the impressive tour we were finally acquainted with the new devices, which have been making the rumor rounds and making tech whispers for months now. It's no surprise - the Moto G is one of the most popular smartphones in tech due to its great hardware package, its impressive software update track record and undeniably great price. The Moto X started it all with a great portable body, uncompromising performance even at its low specs and superb friendliness of use. Motorola had a tall order to replace those devices with better ones and we guess Lenovo will have an even taller one next year. Back to the present - the Moto X and Moto G second generations are here and the Moto 360 is officially on sale. The 2014 Moto X is a departure from its predecessor in its model and looks but somehow feels like the same, great device. Gone are the plastic of old and pseudo-flagship specs and now the Moto X can run with the best of them on its Snapdragon 801 chipset, 5.2" 1080p AMOLED display and a body that now features an aluminum frame, stereo speakers on the front and back panel options featuring real leather and wood. The camera has been improved from the 10MP of the old Moto X to 13MP to the new one. The 2014 Moto G also adds a few improvements to a proven formula. The 4.5" display has been replaced by a 5" of the same 1280 x 720px resolution and the camera has been bumped from a 5MP unit to 8MP. More importantly, it's not about what's new but what's the same - the very low price. Finally, the Moto 360 smartwatch is nothing new - we've seen this one before and mostly were just waiting to touch it and finally be able to buy it. Near the end of our hands-on we're going to show you the Moto 360 from every angle possible. The new Moto X maintains the high customization factor of the original but it's a much more premium device, enough to challenge the likes of the HTC One (M8), Sony Xperia Z3 and the Samsung Galaxy Note 4. Like the Note 4 it has an aluminum frame but you can get the Motorola with actual leather on the back. The metal frame is exposed on the sides and becomes even more prominent on the top. The overall shape is the same as the original - curved back that is 9.9mm at its thickest, with the characteristic curve at the top of the back and the trademark concave Motorola logo, which isn't a button by the way. While almost the same shape, the new Moto X has a screen that's a half an inch bigger and sharper to boot thanks to the jump to 1080p resolution. This bump in screen size makes the new model nearly 12mm taller and 7mm wider than the original, it's also bigger than the 5.2" LG G2 from last year. At least it's shorter than a Sony Xperia Z3 (but almost 3mm thicker). The sloped sides of the _phone_ do conceal some of its bulk but people who wanted a compact flagship device will be disappointed. The silhouette may be the same but the face of the Moto X has changed to a large Moto E. Here the two horizontal bars are front-facing stereo speakers, putting it in direct competition with the HTC One (M8) and Sony Xperia Z3. Some will find the horizontal bars less than attractive though. The face of the new Motorola flagship has three IR sensors (you can easily spot the two on the bottom of the white version). Those enable hand gestures, you can wave over the _phone_ to activate its active display feature (hello, Galaxy S4 and Quick Glance). Another way to wake up the phone is saying "OK Google Now" or any other phrase you like. As for the screen, the Moto X has a 5.2" 1080p Super AMOLED. This pushes the pixel density from 312ppi to 424ppi. While not everyone might notice an improvement, 720p would not have worked on such a big screen (not for a premium device that is). The screen is guarded by Gorilla Glass 3, same as before. Going around the back again, the phone upgrades to a 13MP camera with 2160p video capture. It has a rare ring flash - a translucent plastic around the camera lens with an LED on the left and right. We're not sure two LEDs make a ring flash though, the Acer Liquid S2 had four. A ring flash is meant to provide softer shadows for better-looking photos in the dark, we'll have to test that to see how well Motorola got it to work. For the back you have a big choice of colors, plenty of different woods and several leather options. You can also pick the colors of certain elements on the phone. Motorola abandoned the custom chipset approach and went with a standard Snapdragon 801 (8974AC) chipset. Nothing is lost, the S801 has the hardware for active listening that Motorola had to specifically work into the Moto X chipset last year. And it's as snappy as you can expect for a powerful chipset running almost pure Android. "Almost" pure as Motorola has enabled its active display and active listening magic into the software. There's 2GB of RAM, same as last year. On the connectivity side we can confirm there's LTE connectivity - there was surprisingly little info on that to the point where it seemed like Motorola decided to omit it for some reason. You get the usual dual-band Wi-Fi a/b/g/n/ac, Bluetooth 4.0 LE and NFC, same as last year. The phone uses a Nano-SIM card so you can pop the one from your old Moto X out and put it into the new one. The card toes on top, near the 3.5mm jack. If you're looking for a microSD card slot you won't find one. The base storage is 16GB and you can upgrade to 32GB (there's no 64GB option this time around). To be honest we were hoping for more storage or a microSD slot. A microUSB 2.0 port is at the bottom. Another disappointment is that the battery is sealed and has only 2,300mAh. The LG G2 has 3,000mAh and the Sony Xperia Z3 Compact (which is smaller in every direction than the Moto X) has 2,600mAh. We'll reserve judgment until we run our battery tests but the reality is that a bigger battery is always better, even if the phone is very power efficient. For voice calls the Moto X has four microphones (four! ), which are used to combat background noise. The Motorola Moto G for 2014 brings a bigger display (5" up from 4.5"), higher resolution camera (8MP up from 5MP) and as a result is noticeably bigger than its predecessor. Motorola has retained the core feel of the device with the same body materials and design but has added a few niceties like the stereo speakers above and under the display on the front. Despite going for a wider diagonal by 0.5" the 720p resolution is still the same and has been stretched a little thin at 294ppi. It's still adequately sharp and we can't frown at the quality of the display. It's an IPS unit so the viewing angles are very good. The Moto G feels nice in the hand. It's not as palm friendly due to its new size but is still comfortable. Motorola retained the nice curvature on the back and the dimple where the company logo lies, we've found than the curve lands nice in the palm and the index finger instinctively lands on the dimple. Sadly, Motorola decided to keep the now-aging Snapdragon 400 chipset of the original Moto G and it's now spanning across three Moto G devices. It does a fine job of handling Android 4.4.4 stutter-free but will become overwhelmed with more demanding tasks like gaming. The camera snaps photos a little slowly but this could also be a software issue. The battery is the same capacity and stands a little low at 2,070mAh. Last year's model showed middling battery performance and we guess this one will fare even worse. But that stands to be seen when the device lands at our HQ. The Motorola Moto G is a great first smartphone for many people - it's simple to use thanks to stock Android 4.4.4 and is a good investment for the future as it's bound to receive Android L once that becomes available to the masses. The hardware is simple, as it was last year, but we have no doubt that it will be durable. Motorola's splash resistance will also help to keep the phone functioning even through rough patches. Is this the best midrange smartphone to be had right now? It's in the running for sure. If you like clean software and hardware and getting that precious bit of extra for your money, then it probably is, yes. This is the Motorola Moto 360 and we've all seen it before. More than once. Its been official for some 5 months now but we've been impatiently waiting for it to become available and it finally has, sort off. You can get the Moto 360 in the States but not outside of it yet. So it leaves us yearning users with three options - importing one from the US or waiting for Motorola to release it on other continents too, and hope that this isn't another Moto X (2013) affair where Motorola took its sweet time and brought the device outside of the US some good 4 months later. The Moto 360 is the first rounded smartwatch to become available and the first Android Wear one in the US. It looks gorgeous and feels premium. It's actually lighter than its main rivals from LG and Samsung but feels more solid in the hand. The display is one of the smallest among its smartwatch peers at 1.56" but feels among the biggest thanks to its round shape and the fact that the display takes up the entire watchface, there are no bezels. Motorola achieved this by placing all of the display drivers in that little letterbox-like black spot at the bottom of the display, allowing the diagonal to expand to the very outer-edge. The Moto 360 sits comfortably on our wrists thanks to a smooth and slightly curved design to its bottom. It has a heart-rate sensor on the bottom that can constantly measure your hearbeat and will automatically detect whether you're in Inactive (40-92 bpm), Active (92 - 129) or Vigorous (129-185) mode. That means that unlike Samsung's Gear series it will know when you're exercising without the need for manually activating the mode. The Moto 360 has the same 320 x 320 resolution we've seen on many a smartwatch (the round-faced LG G Watch R is one) and the display looks pretty sharp. Colors are saturated and the screen get as bright as you'd like. It also adjusts to ambient lighting automatically so that you needn't go into the settings menu every time your eyes hurt from it. It's an LCD and not OLED so you don't get as deep blacks as we would have liked. The Moto 360 will come with a genuine leather strap immediately for the price of $250 but there are steel black and silver options that will retail with the watch for $300 this fall. Additionally, if you go for the Moto 360 now with the leather strap you could just get a steel band separately when they become available, for $80 a pop. Charging the Moto 360 is done by nestling the watch into its suave little bedside cradle. It uses coils embedded into the heart rate sensor to charge. It also converts the Moto 360 into a bedside watch - ingenious. The Moto 360 uses Android Wear, an OS built by Google from the ground up to serve our wrists. It's made to work with your Android phone and allow you to send voice commands to do different things. The sloped sides of the phone do conceal some of its bulk but people who wanted a compact flagship device will be disappointed. The face of the new Motorola flagship has three IR sensors (you can easily spot the two on the bottom of the white version). Those enable hand gestures, you can wave over the phone to activate its active display feature (hello, Galaxy S4 and Quick Glance). Another way to wake up the phone is saying "OK Google Now" or any other phrase you like.